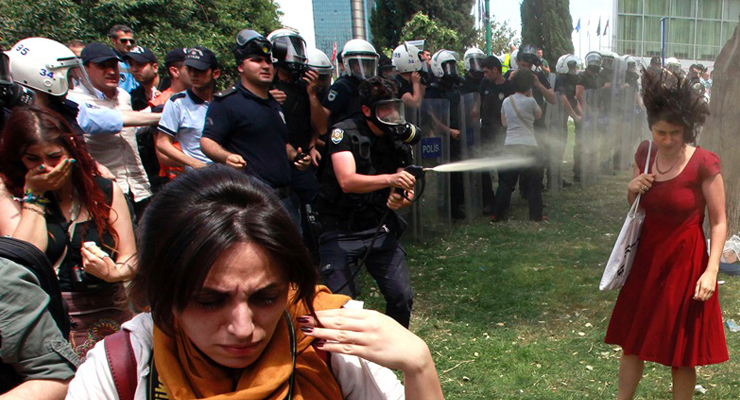 The infamous police officer who sprayed tear gas directly into the face of a female protestor, for which he received a suspended 20-month jail sentence, has joined the ranks of others who pin blame for any wrongdoing on Turkey’s new scapegoat, the Gülen movement. Widely shared on social media, the image of the “woman in red,” who was teargassed in the face, became a major symbol of the anti-government demonstrations that started at İstanbul’s Gezi Park in 2013. Fatih Zengin, the police officer responsible for the disproportionate use of force on the woman, is now blaming his superior, whom he considers to be affiliated with the movement. Zengin received a suspended sentence of 20 months in prison and was ordered to plant 600 trees as punishment. According to Turkish media, Funda Sadıkahmet Alp, a lawyer representing Zengin, has requested a retrial. “Since July 15, it has become obvious whom Ramazan Emekli [his superior] served and why he facilitated the conviction of my client,” Alp said. The government accuses the movement of masterminding a July 15 coup attempt and to date has detained 72,000 people and arrested 34,000 over their links to the movement. The movement denies any involvement. Blaming the movement for wrongdoings is nothing new. Earlier, Soma Holding Chairman Can Gürkan said Turkey’s worst mining accident that killed 301 people at his mine was a plot by the movement.